Chromaphis aphids are small, pale and yellow with all viviparae winged and living on walnut (Juglans species). This genus has just 2 species, both Palaearctic. Chromaphis aphids have also been recorded on Aleurites moluccana (the candlenut, or Indian walnut, a flowering tree in the spurge family) which presumably acts as a reserve host, rather than a true secondary host. Adult viviparae of Chromaphis juglandicola are all winged. 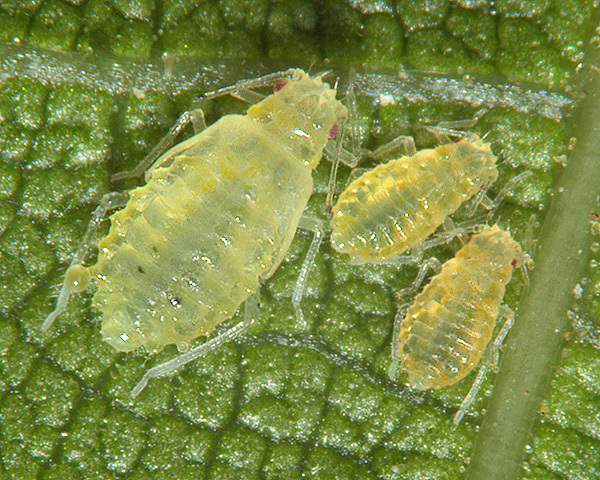 Fourth instar nymphs (first picture below) are yellow or yellowish white, and (in autumn) have paired brown spots on abdominal tergites 4 and 5. The alates (second picture below) are yellowish-white with pale brown thoracic lobes and paired brown spots on abdominal tergites 4 and 5. The antennae have dark brown tips and are about half the body length. The terminal process is 0.2 times the length of the base of the last antennal segment. The siphunculi are conical and smooth. The body length of Chromaphis juglandicola alates is 1.2-2.3 mm. 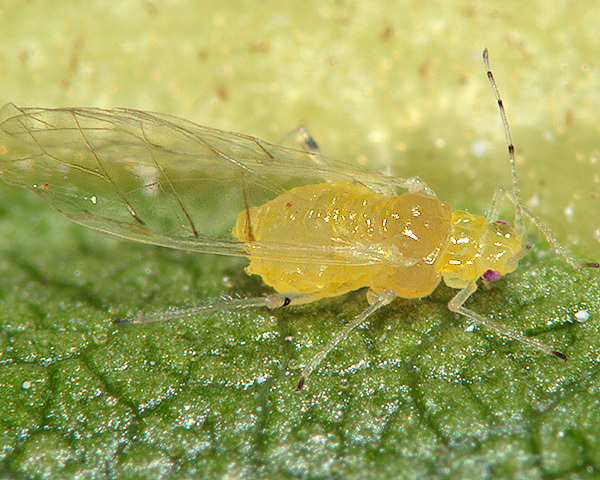 The small walnut aphid lives scattered on the undersides of leaves of walnut (Juglans regia). Oviparae and males occur in May-June in India, and in autumn in Europe and the USA. Chromaphis juglandicola is found in Europe, Central Asia, India, Pakistan, China and North America.